Theater Style Popcorn, Fresh and Hot! POP-POP-POP! The all-time favorite fun food. Listen to the kernels pop, watch the popcorn jump out of the kettle, smell that wonderful aroma and taste that delicious popcorn! 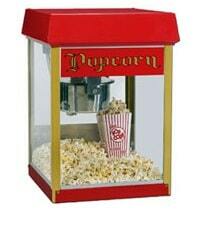 Includes popcorn, oil, seasoning, and serving bags for 50 servings. Includes: Popcorn/Oil/Salt/Bags for 50 servings. Additional 50 serving packs are $15. Minimum space: 3'L x 3'W x 3'H.